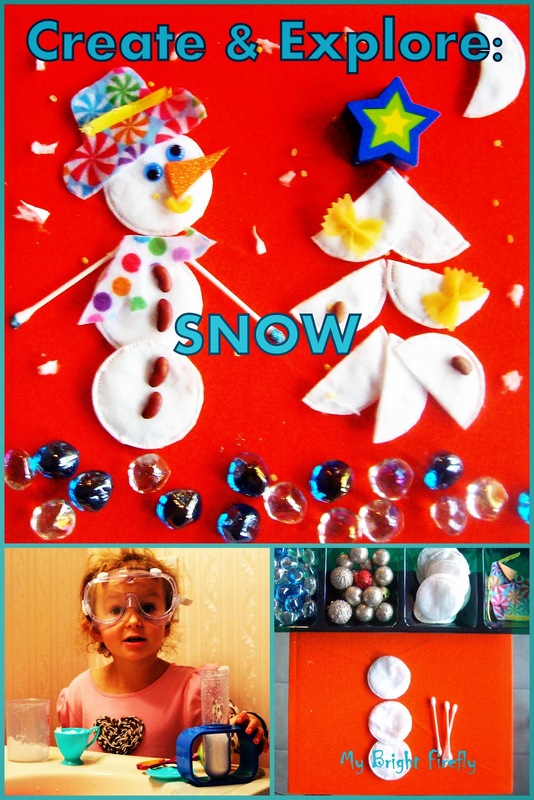 Winter Preschool Activities: the Art and Science of Snow. My Firefly explored the properties of snow in a free-play set up. Building a snowman and a winter scene with the cotton pads and a sensory bin was so much fun! She enjoyed these activities again and again. No glue was used: we played to explore using supplies as a construction set. For more winter fun activities, visit 21 Gorgeous Snowflake Ideas. "The Story of Snow: The Science of Winter's Wonder" by Mark Cassino was our book for these activities (affiliate link below). We caught the snowy days and brought some snow inside. Will it be more snow any time soon? Anybody is a fan of the white Christmas? The doll's bath tab with snow was placed into the sink. I offered a variety of cups and spoons for a free-play set up. At this age, we mainly needed to learn that the snow melts and turns into water. I admire kids' curiosity and the ability to observe and soak in huge chunks of information. How to spark that curiosity? What would spark that awesome curiosity? If you know the answer, go with it! You will be rewarded by the joy and admiration in your kids' eyes. I was lucky to get the moment with a camera. That's why the picture below is so special to me. The looking glass helps to see pretty snowflakes outside, but as soon as snow is inside - the snowflakes are not visible any longer. Snow cupcakes are made easily when the snow sat in the sink for a while. The snow melts faster when the water is added to the tub. "Squishy snow" is more fun... until it turns into water. My Firefly built a snowman again and again. We reviewed counting to 3, "stuck in between" (2 in between 1 and 3), and subitizing. What belongs with the scene? (snow, snowflakes, flowers, butterflies, apples). Pictured below: our sensory bin of "building parts". There are different beans, shapes of pasta, googly eyes, pieces of drinking straw, etc. I keep it in a zip-lock bag and offer supplies in a tray when we need it. We used Velcro Memo Board as a base. The elements don't stick to it, but the board helped to prevent everything from sliding around and defined the space for the scenes. This activity was very engaging! I love when creativity and pretend playing are in use. I think it might be great for a quick and easy entertainment at a Christmas party. Land, Air, and Water. G is for Globe.